Need more information about booking Home 8506338 ? This cozy 4-bedroom cottage is cool in summer and has a fire place for cold winter days. The mountain views are amazing and you are close to all the attractions in this beautiful area. Our valley is on a gravel road between R62 and N1. From us it is 28km through the Seweweekspoort and 31km to the tar road towards Laingsburg. Calitzdorp have a few wine-tasting options and also a restaurant or 2. Ladismith is known for their lovely cheese and you'll find Lammie se Slaghuis have the best sausage, sosaties, biltong and droëwors in the area! Oudtshoorn with the ostrich farms, Cango Wild Life Ranche and Cango Caves is not far away. Wilgewandel is also on your way to the Caves, a nice stop for kids! 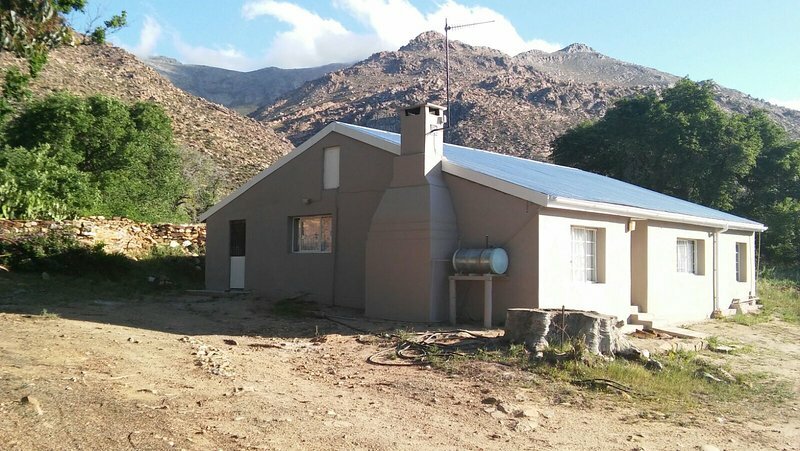 You can visit the Seweweekspoort, Bosluiskloof Pass, Vleiland and Rouxpos. We are staying about 1.5km from the cottage. So the guest is welcome to walk or drive down to us. We do have a farm shop with all the necessary items. We also sell ice and sausage etc etc. If the bakkie go to the veld the guests are welcome to jump on!!! You can get in touch with Jonel (the owner) through the contact form on this page. Send Jonel (the owner) an email through the contact form on this page. Alternatively, if there’s a phone number on this page, you can call them. How do I contact Jonel (the owner)? If you’ve already booked, go to Manage your holiday booking to view Jonel the owner's contact details or send them a message. Or send Jonel (the owner) an enquiry through the Contact the owner/manager form if you’d like a quote or more info first. When you pay online through the Book your stay form, a booking request is sent to Jonel (the owner). You’ll find out within 24 hours whether they’ve accepted - no money will leave your account before then. You can also request a quote from Jonel (the owner) through the contact form. The owner will email you the total cost for your dates and a link to book and pay online. Use the Book your stay form to pay provisionally online. You can pay by credit/debit card or PayPal. Jonel (the owner) will have 24 hours to accept the booking and no money will leave your account before then. Why can't I call Jonel (the owner) before booking? You’ll need to contact Jonel (the owner) to do this. Send them a message in Manage your holiday booking or through the contact form on this page. You can request to change the dates or number of people on your booking via the Manage your holiday booking page. To change your holiday dates use the Edit booking button. If you need to change the number of guests staying then send Jonel (the owner) a message. If Jonel (the owner) agrees, they’ll send you a revised quote outlining the changes. You can review and accept/decline this from the Manage your holiday booking page. You’ll have 48 hours to take action before the revised quote expires.